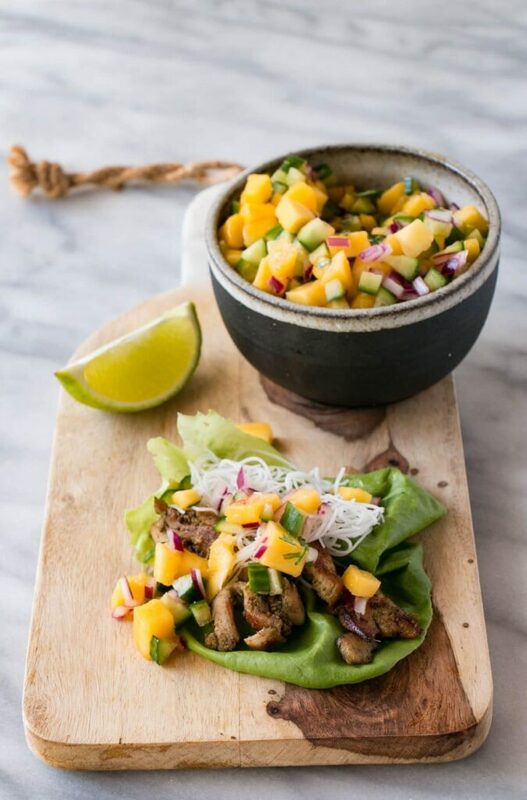 Lemongrass mango chicken, vermicelli noodles, and mango salsa make up the scrumptious interior of these Mango Lemongrass Lettuce Wraps. This post and giveaway is kindly sponsored by Kiju Organic. Skip down to enter a fantastic back to school giveaway of Kiju products and a Planet Box Shuttle Box!!! Back to School is officially around the corner. I’m not happy to see summer fade, but I am looking forward to a bit more structure and routine in our lives. Did you catch all the back school snack ideas I have for you? Here’s one post with 10 preschooler snacks! 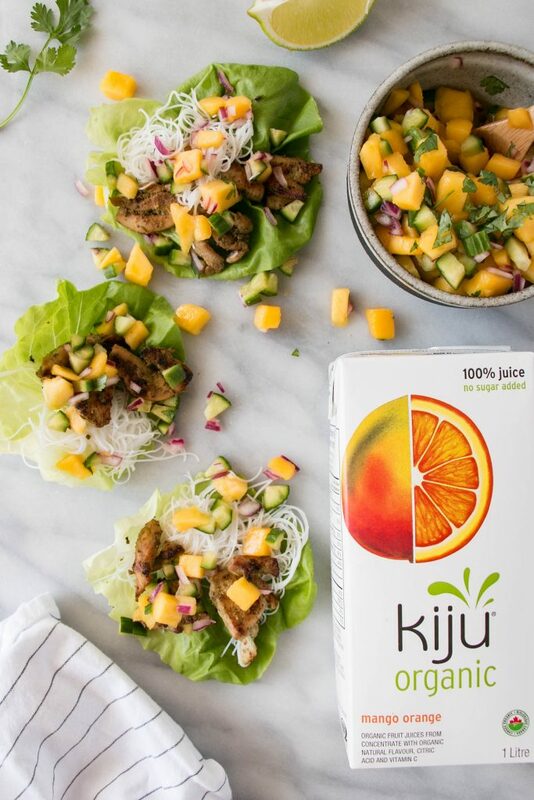 I’m thrilled to be teaming up with my favourite juice company to bring you a Back to School Giveaway and a quick and delicious dinner featuring Kiju Mango Orange Juice. The rush of back to school can sometimes seem overwhelming. Paperwork, replacing outgrown clothes, new schedules and so forth is a lot to take on for anyone. That’s why I’ve teamed up with Kiju Organic. What’s better than FREE back to school organic products AND one of the best lunch boxes out there? Entry is below to make your back to school life much less complicated. I am a huge fan of this Planet Box Shuttle Box (no affiliation). It’s been the perfect size for my preschoolers and we will use it throughout the various school breaks for snacks we all share on the go. My kids are total segregated eaters so the separate compartments are ideal for us. There’s a also a separate lidded “dipper” for more liquid like foods (yogurt, hummus, etc.) that you don’t want mixed with the rest of the foods. Why Kiju Organic? Because I like knowing that the fruits going into each juice box is organic and without harmful additives. 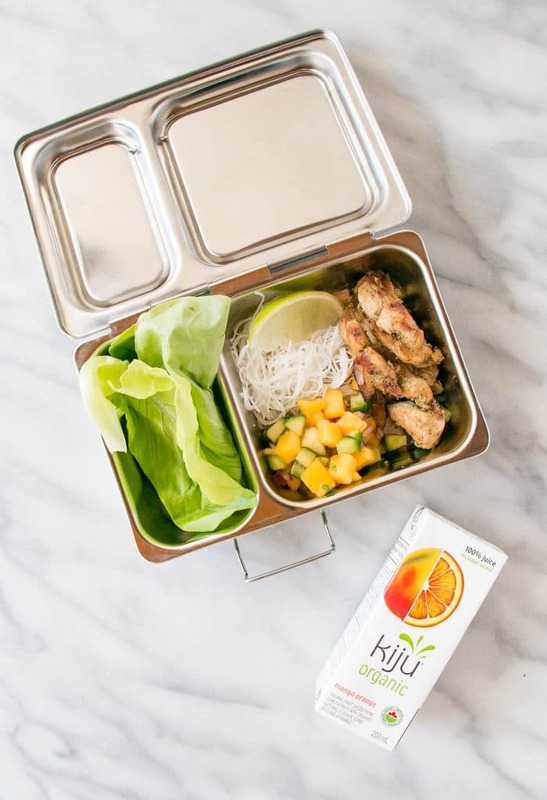 I do keep juice boxes as a treat, but when we have them, we always turn to Kiju Organic. Sweet sticky chicken with thin rice noodles and a mango salsa, all wrapped up in lettuce. Perfect healthy and delicious dinner! 1/4 red onion, peeled and chopped into small pieces. Blend juice, lemongrass, garlic, cilantro, coconut milk, vegetable oil, and salt on high until liquid. Place contents in a glass container or a large freezer bag. Add chicken and mix until chicken is fully coated. Let marinade for 20 minutes to 8 hrs. Set a skillet to medium-high heat. Remove chicken from marinade using a slotted spoon and discard marinade. Cook chicken, stirring occasionally for 7-9 minutes. Chicken should begin to brown and get almost sticky. Meanwhile, cook vermicelli noodles as per package instructions and set aside. Meanwhile, remove skin from mangos and carefully chop into small cubes. Chop cucumber into a similar size. Add both mango and cucumber to a medium bowl. Add red onion, Kiju juice, lime juice, and sea salt. Toss gently until combined. To assemble serve lettuce pieces, noodles, chicken, and salsa and build lettuce cups with layers of each. 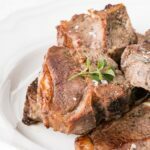 * cooking time does NOT include marinade time of 20 minutes to 8 hours. Interesting! I don't think I've ever had lemongrass. 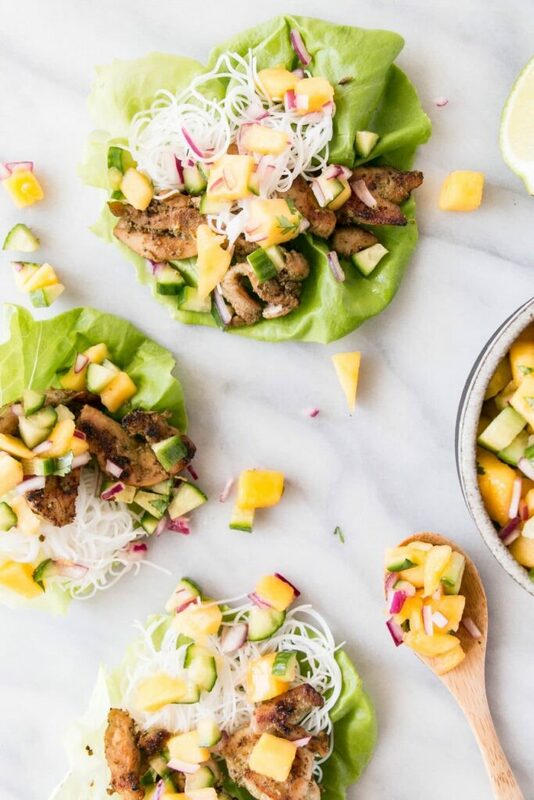 These mango lettuce wraps look so delicious!! Yum, yum. I am so going to have to make these, they look like a wonderful idea for a lunch! Love the mango angle, usually go toward lime. These look amazing. I've recently been really obsessed with lettuce wraps. 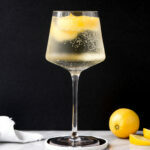 Looks delicious, and fingers crossed for the giveaway win! That lunch box looks perfect. Can't wait to try the recipe! We love Planet Box and of course Kiji Juice! The kids love the lemonade! WOWZA~ definitely going to add this to my bookmarks and make sometime soon. Looks fantastic. This looks so good! Will try it out for the little ones. Such beautiful lettuce wraps! These definitely look like something my kids would enjoy. What's a great giveaway! We eat a lot of chicken in our house! I love trying new recipes! 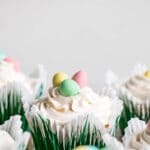 These look delicious and so easy! I'm a huge fan of the mango/chicken combination so will be bookmarking this for sure. Sounds delicious, I can't wait to try it!